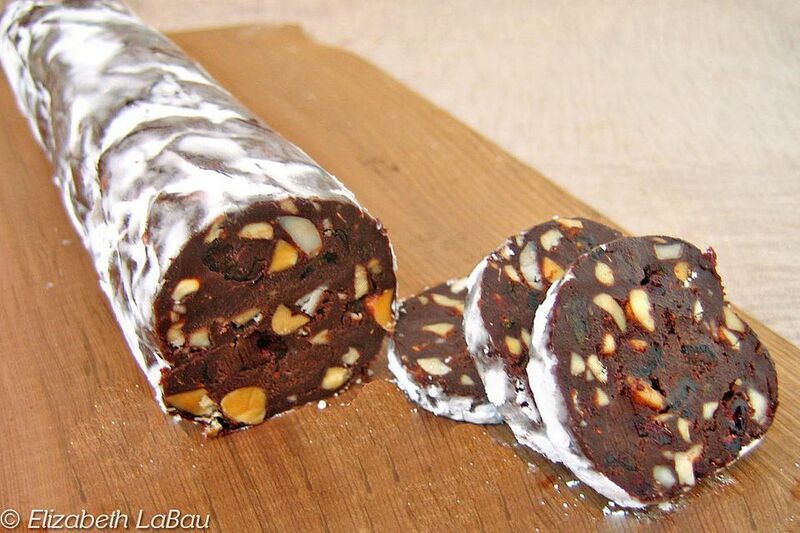 This Chocolate Salami recipe produces a beautiful log of chocolate studded with an assortment of dried fruits and nuts. It’s a great way to use up leftover cake or cookie crumbs, and can be customized with any fruits and nuts you like. I like using chocolate cake best, but you can use any flavor of cake, cookies, or brownies that you like. If you happen to have leftover ganache from another baking or candy project, you can use that instead of making it fresh as described in the recipe. Place the chopped chocolate in a medium heat-safe bowl, and place the cream in a small saucepan over medium heat. Bring the cream to a simmer, so that bubbles appear on the edges of the pan, but do not let it boil. Pour the hot cream over the chopped chocolate and let it soften for a minute, then whisk it until the chocolate is melted and the mixture is well-combined and smooth. Set aside your ganache for now. Place the cake or cookie scraps in the bowl of a food processor and pulse until you have fine crumbs. Put the cake or cookie crumbs into a large bowl. Add the chopped fruit, nuts, and salt to the cake crumbs and mix until well-distributed. Add the vanilla extract to the ganache, and then pour the ganache over the cake mixture. Stir until well-combined and there is a uniform texture throughout. Press some cling-wrap to the top of the mixture and refrigerate until firm enough to roll, at least 1 hour. Once the candy has firmed up, scoop half of it from the bowl and, using waxed paper or parchment, roll it into a log about 2 inches in diameter and 9 inches long. Once it is a cylinder, roll it on the counter a few times to try and get it as round as possible. Repeat the process with the second half of the candy, forming an identical log. Place the logs on a baking sheet and freeze them until firm, at least 2 hours. The salami can be kept frozen for up to a month, but if you plan to freeze them for that long, wrap the logs with plastic wrap to prevent odors or freezer burn. About 15 minutes prior to serving, remove the logs from the freezer. Roll them in powdered sugar to make them resemble salami. Cut them into thin slices and serve. The logs can stay at room temperature for several hours before getting too soft. If they do start to get too soft, refrigerate or freeze briefly to firm them up. If the sugar coating starts to melt, re-roll them in sugar as needed.